Small family run boutique Hostel right on the Beach! 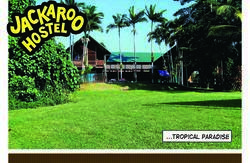 We are the only hostel in Mission Beach Village, next to all bars, shops and restaurants. FREE Accommodation with any 14,000 ft Sky Dive booked with our booking desk. The Retreat has clean facilities with an open air kitchen, Laundry, Internet and Satellite pay TV and Video room. Free tea, coffee and sugar are available. 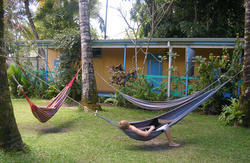 We offer free rainforest nature walks and Wallaby spotting. Phone us for your free courtesy bus pickup. Tropical rainforest walks, secluded beaches, fishing, safe swimming and snorkeling are all only a few minutes walk from our place! Book 5 nights and stay for 6, any type of accommodation. We offer air-conditioned share rooms, twin rooms and double rooms. $14 meal deal at the newly renovated zenbah, Only $14 for a meal and beer, wine or soft drink every night! Relax in the pool room, test yourself with the weekly quiz or enjoy a cocktail 10% off for all Mission Beach Retreat guests. Our place is right in the main street on the beach . Arriving by car from Cairns or Townsville we are on the right hand side of the road just after the shops right in the centre of MISSION BEACH village! Note that we are the ONLY one in the village-if you come from Townsville you need to go past WONGALING Beach another 4KM(it is confusing as the Mission Beach resort is at Wongaling Beach!